I know that sometimes understanding who inherits what kind of DNA from whom can be confusing, especially with four kinds of DNA to keep track of. Y DNA is passed from the father to male children only (blue boxes). This is the paternal surname line. Mitochondrial DNA is passed from women to all of their children, but only females pass it on (red circles). Half of each parent’s autosomal DNA (chromosomes 1-22) inherited from ancestral lines, meaning all lines shown above, is passed to each child – but not the same exact half is passed to different children. The X chromosome has a distinct inheritance pattern that is helpful to genealogists, but is often confused with mitochondrial DNA. You can read about the X chromosome’s unique inheritance path in the article X Matching and Mitochondrial DNA is Not the Same Thing, along with some helpful fan charts. I recommend that you test with or transfer to each of the vendors. Have you already taken an autosomal DNA test and want to transfer between vendors? Here’s a handy-dandy chart for you. Note that while Family Tree DNA does accept the Ancestry V2 chip, as well as the 23andMe V4 chip, because they are incompatible platforms, you’ll only see your closest matches, meaning about 20% of the total matches you would receive if you tested on Family Tree DNA’s own chip. For that reason, I generally recommend testing at Family Tree DNA unless you tested on an earlier chip version at one of those vendors. For more information about transfers, including when the various chips were in use, please read Autosomal DNA Transfers – Which Companies Accept Which Tests? Recently, I’ve noticed a lot of confusion surrounding X DNA matching and mitochondrial DNA. Some folks think they are the same thing, but they aren’t at all. It’s easy to become confused by the different types of DNA that we can use for genealogy, so I’ll try to explain these differences two or three different ways – and hopefully one of them will be just the ticket for you. I suspect the confusion has to do with the fact that mitochondrial DNA and the X chromosome are both associated in some manner with female inheritance. However, that isn’t always true in the strictest sense, as women also inherit an X chromosome from their father. The difference, as you can quickly see, is that females inherit an X chromosome from both parents, while males only inherit the X from their mothers. That’s because males inherit the Y chromosome from their father instead – which is what makes males male. As a quick overview about inheritance works, you might want to read the article, 4 Kinds of DNA for Genetic Genealogy. The good news is that both mitochondrial DNA and the X chromosome have very specific inheritance paths that can be very useful to genealogy, once you understand how they work. Mitochondrial DNA is inherited by both genders of children from their mothers. Mitochondrial DNA is NEVER recombined with the mitochondrial DNA of the father – so it’s passed intact. That’s why both males and females can test for their direct matrilineal line through their mitochondrial DNA. I’ve written an in-depth article titled, Mitochondrial DNA – Your Mom’s Story that might be useful to read, as well as Working with Y DNA – Your Dad’s Story. The X Chromosome is autosomal, meaning that it recombines in every generation. If you are a female, the X recombines just like any other autosome, meaning chromosomes 1-22. You receive a copy from each parent. The 23rd pair of chromosomes is the X and Y chromosomes which convey gender. Males receive an X from their mother and Y from their father. The Y chromosome makes males male. Females receive an X chromosome from both parents, just like the rest of chromosomes 1-22. If you are a male, the inheritance path of the X chromosome is a bit different from that of a female, because you inherit your X only from your mother. Females inherit their father’s ONLY X chromosome intact, which he inherited from his mother. Females inherit their X chromosome from their mother in the normal autosomal way. A mother has two X chromosomes, so the mother can give a child either chromosome entirely or parts of both of her X chromosomes. Because of the different ways that males and females inherit the X chromosome, the inheritance path is different than chromosomes 1-22, portions of which you can inherit from any of your ancestors. Conversely, you can only inherit portions of your X chromosome from certain ancestors. You can read about more about this in the article, X Marks the Spot. Female X inheritance chart. For male distribution, look at my father’s side of the tree. My own colorized X chromosome chart is shown above, produced from my genealogy software and Charting Companion. An X match MUST COME from one of the ancestors in the pink and blue colored quadrants. It’s very unlikely that I would inherit parts of my X chromosome from all of these ancestors, but these ancestors are the only candidates from whom my X originated. In other words, genealogically, these are the only ancestors for me to investigate when I have an X DNA match with someone. Because of this unbalanced distribution of the X chromosome, if you are a male and you match someone on the X chromosome, assuming it’s a legitimate match and not a match by chance, then you know the match MUST come from your mother’s side of the family, and only from her pink and blue colored ancestors – looking at my father’s half of the tree as an example. If you are a female the match can come from either side, but only from a restricted number of individuals – those colored pink or blue, as shown above. X chart with Y line included in purple, for males, and mitochondrial line in green. My mitochondrial line, shown on the X chart would consist of only the women on the bottom row, extending to the right from me, colored in green above. My father’s Y DNA line would be the purple region, extending along the bottom at left. Of course, I don’t have a Y chromosome, because I’m female. Of the individuals carrying the purple Y DNA, the only one with an X chromosome that a female could inherit would be the father. A female would inherit both the mtDNA of all of the green women, plus could also inherit an X chromosome (or part of an X) from them too. For males, looking at my father’s half of the chart. He can inherit no X chromosome from any of the purple Y DNA portion, because those men gave him their Y chromosome. My father would inherit his mitochondrial DNA from his direct matrilineal line, shown in yellow, below. X chart with mitochondrial inheritance line for mother (and child) shown in green, for father shown in yellow. Both yellow and green lines can contribute to the X chromosome for males and females. In my father’s case, the females in his tree that he can inherit an X chromosome from are quite limited, but people who have the opportunity to pass their X chromosome to my father are never restricted to only the people that pass his mitochondrial DNA to him. However, the X chromosome contributors always include the mitochondrial DNA contributors for both males and females. In my father’s case, above, he inherits his X chromosome from his mother, who can only inherit her X from the people on his side of the chart shown in yellow, blue or pink. In essence, the people in yellow or to the left of the yellow with any color. As his daughter, I can inherit from any of those ancestors as well, since he gives me his only X, who he inherited from his mother. I also inherit an X from my mother from anyone who is green, pink or blue on her side of my chart. As you can see, my X can come from many fewer ancestors on my father’s side than on my mother’s side. It just happens that ancestors in the mitochondrial line also are able to contribute an X chromosome and either gender can inherit parts of their X chromosome from any female upstream of their mother in the direct matrilineal line. However, only the direct matrilineal line (yellow for your father and green for your mother) contributes mitochondrial DNA. None of the other ancestors contribute mtDNA to this male or female, although females contribute their mtDNA to other individuals in the tree. For a more detailed discussion on inheritance, please read the article, “Concepts – ‘Who to Test Series”. While the generally accepted threshold for autosomal DNA is about 7cM, for X DNA, there appears to be a much higher incidence of false matches at higher levels than the rest of the chromosomes, as documented by Philip Gammon as in his Match-Maker-Breaker tool. This appears to have to do with SNP density. I would encourage genetic genealogists to consider someplace between 10 and 15 cM as an acceptable threshold for an X chromosome match. This of course does not mean that smaller segment matching can’t be relevant, it’s just that X matches are less likely to be relevant at levels below 10-15 cM than the rest of the chromosomes. As you can see, the mitochondrial DNA is passed from one line only – the direct matrilineal line – green to my mother and then me, yellow to my father. The mitochondrial DNA has absolutely NOTHING to do with the X chromosome, as they are entirely different kinds of DNA. It just so happens that the individuals who contribute mitochondrial DNA are also some of the ancestors who can contribute an X chromosome to either males or females. The yellow and green ancestors always contribute mitochondrial DNA, but the pink and blue NEVER contribute mitochondrial DNA to the father and mother in our chart. Purple – Y chromosome to father only. Y is passed on to a male child, but not to females. Yellow – Mitochondrial always to father. X always from mother to males but X can come from either yellow or pink and blue ancestors upstream. Green – Mitochondrial always to the mother. Females receive an X chromosome from their green mother and also from their father, who received his X chromosome from his yellow mother. PInk and blue on father’s side – contribute to the father’s X chromosome, in addition to yellow. Pink and blue on mother’s side – contribute to the mother’s X chromosome, in addition to green. If you are a male and see an X match on your father’s side of the tree, you know that match is either actually coming from your mother’s side of the tree, or the match is false, meaning identical by chance. The great news is that X matching is another tool with special attributes in the genealogist’s toolbox, along with both mitochondrial and Y DNA. Your X chromosome test is included as part of the Family Finder test. You can order the Family Finder or the mitochondrial DNA tests here. Over the past couple years, Charting Companion has implemented DNA focused reports. I covered their first report, the X Ancestor Chart when it was first introduced, but they have since added mtDNA charts, and most recently X Descendant Charts. I love these reports and how useful they are to the genealogist. It’s important to understand that both your mitochondrial DNA and the X chromosome have special inheritance paths and therefore, special uses for genetic genealogy research. I wrote about the X chromosome here and here. The article 4 Kinds of DNA for Genetic Genealogy is a brief description of the various kinds of DNA testing available to genetic genealogists, and who can test for which kind. In males, the X chromosome is only inherited from the mother, because the father gives the male a Y chromosome, which is what makes the male, male. In females, the father contributes his X chromosome to his daughter, as does her mother. However, the father only received an X from his mother – so you can see that the inheritance pattern for the X chromosome is not the same as other chromosomes where all children receive 50% of their inherited DNA from each parent. Because of this unusual inheritance pattern, you can easily tell whether an autosomal match that shares an X chromosome could descend from the ancestor you think they might. If you’re a male and you think an X match comes through your father or one of his ancestors – think again, because it can’t. Here’s my hand-drawn chart of the ancestors that portions of my X chromosome could have descended from. Now that I have charting companion, I no longer have to hand draw this chart. Charting Companion does it quickly and easily for me. And it’s much, MUCH neater! The X chromosome is tested as part of an autosomal DNA test, but not all vendors report X matches. Ancestry does not provide information about the chromosomes where you match anyone, so at Ancestry, there is no way to know if you match someone on the X chromosome. Family Tree DNA’s Family Finder test does test for and report X chromosome matching and so does GedMatch if you upload your raw data files from any vendor. Mitochondrial DNA is not passed to the children from males. Females pass their mitochondrial DNA to both genders of their children, but only females pass it on. This pedigree chart below shows the Y and mitochondrial DNA inheritance path for a brother and sister. Both siblings received their mother’s mtDNA, which reaches back in time directly up the matrilineal line ONLY. The great news is that since the mitochondrial DNA is never admixed with the father’s DNA, it’s a direct pipeline that informs us about the matrilineal line for hundreds and thousands of years back in time. The bad news is that in order to find out about the mitochondrial DNA of another ancestor in your tree – meaning all of your ancestors that don’t have red circles in the chart above, you must find someone descended from a female through all females to the current generation, which can be a male. Testing for mitochondrial DNA is available through Family Tree DNA. Let’s say you want to find out about the mitochondrial DNA of your father’s mother to fill in one of the haplogroups in your DNA pedigree chart. You would need to locate an individual to test who carries your father’s mother’s mitochondrial DNA. Your father can test, if he’s living and willing. If your father is deceased, and he had no siblings, and his mother is deceased with no siblings, you’re going to have to go on back up that tree until you find someone with living descendants who descend through only females to the current generation, which can include males. Charting companion makes finding those descendants easy. You can purchase Charting Companion at this link. And for those of you wondering, no, I don’t have any financial interest in Charting Companion or Progeny Genelaogy, nor is this a paid article, nor do I receive any commission or kickback or anything like that if you purchase this product, nor am I related to or know the owner. I don’t accept or write any articles for pay from anyone or any company, ever, and never have. I did, however, receive a free update to the Charting Companion software I had already purchased, but you will too if you have already purchased version 6. After installing Charting Companion, which is painless (I had to install the latest upgrade for this article), Charting Companion opens the file you indicate, which is typically your production file for your genealogy software. You’ll select the person you want to be reflected as the source or center of your charts or reports in the yellow Name field, shown below. In my case, I selected Barbara Dreschel to be the person around whom the reports will center. In case you’re wondering, “Babbit” was her nickname and J1c2f is her mitochondrial DNA haplogroup. The only effective way I’ve discovered to maintain haplogroup information is as a middle name, so that’s what you’re seeing. Next, you’ll select the type of report that you want to create. You’ll want to click on the “Charts and Reports” tab and for the X chromosome charts, you’ll want to select either the Ancestor Charts, or the Descendant Charts. Net, you’ll select the X version, which is located under “color” because the proper people are colorized in pink and blue. Ancestor charts generally start with you and work their way back in time. My X version shows which ancestors I inherited my X chromosome from. This can be very helpful when evaluating matches. In some cases, you cannot have a match to a particular person on the X chromosome from the particular line in question. Ancestor charts come in two flavors, one is a traditional ancestor chart, the fan version shown earlier in this article, and the second version is a pedigree chart. These charts make it easy to see who you could have received your X chromosome from – so X matches must be from the pink and blue colored ancestors and cannot be from ancestors whose boxes are not colored. For example, if I match a descendant of John Y. Estes, located at the top of the pedigree chart, above, on the X chromosome, I know the common ancestor that I received the X DNA from is NOT John Y. Estes, because I couldn’t have inherited any X DNA from him. That’s easy to discern, because there is no coloration in John Y.’s box. So an X match to a descendant of John Y. Estes is not FROM John Y. Estes. It’s either a false match or the matching X chromosome is from another common ancestor. Of course, that doesn’t mean we both aren’t descended from John Y. Estes – it only means that our X match is not from John Y. I wrote about false matches here. When I receive an X match to someone and we’re trying to find a common ancestor, I suggest that my match print this same chart for themselves and that will help them determine which ancestors or ancestral lines we might potentially have in common. Recently Charting Companion announced a new tool, Descendant X Charts. On these charts, the ancestor is the focus and the descendants who inherited their X chromosome are colored either pink or blue. Part of the Descendant X Chart for Barbara Drechsel is shown below. You can click on any graphic to enlarge. Descendant Charts look a little different than Ancestor Charts. Don’t be confused by the white box between Elnora Kirsch and her daughters. That’s just her husband, Curtis Benjamin Lore. While he contributes an X chromosome (with daughters) or doesn’t (with sons,) it’s not HIS X chromosome we’re tracking in this chart, it’s the X chromosome of Barbara Drechsel. Curtis would be shown either on his own ancestor chart, or you can create a Descendant X Chart for Curtis. You might notice in this diagram that this family is particularly prone to not having children. Trying to find ANY DNA participants has been very challenging. However, when I do find them (fingers crossed) I’ll know immediately if they (and I) could possibly carry the X chromosome of Barbara Drechsel by looking at these charts. I’m someplace to the left on this chart, but off the edge of the graphic above. My favorite Charting Companion charts are still the fan charts though, shown below, because they are compact and succinct and you can see everything on one chart on one page. To find descendants who carry the mitochondrial DNA of any female, select the person whose mtDNA-carrying descendants you want to find. Then click on the Charts and Reports tab and select the Descendant Chart. You’ll then see various options at the top, where you’ll want to click on the Contents tab. Select Mitochondrial DNA. Note that you can also select the Y chromosome DNA, but that’s much more evident if you’re looking for a male, because the surname stays the same, so DNA testing candidates are generally rather obvious. On the mtDNA Descendants Chart above, the people in pink and blue carry the mtDNA of Barbara Drechsel. The blue people, males, won’t pass it on to their offspring, but the pink people, females, will if they have offspring. You can see that many females in this family did not have children, so there are several dead ends for Barbara’s mtDNA, including one more daughter who is off of the right hand side of the page. On your computer, you can scroll and the printed reports allow you to overlap. The Mitochondrial DNA Chart is a great tool to find out who carries the mitochondrial DNA of any ancestor. I love tools that help people understand their DNA and how it’s useful to their genealogy. The X charts make seeing the X inheritance path so much easier than trying to explain in verbiage (or drawing by hand) – and provides an easy visual to quickly identify whether a particular ancestor could potentially be responsible for an X DNA match. For mitochondrial DNA, the charting tool makes the task of finding appropriate descendants to test much easier. It can also work in reverse. If you want to know if a particular person is a candidate for testing for a specific ancestor’s mtDNA, it’s easy to see immediately if their box is colored pink or blue. I especially love tools that are ubiquitous and run with almost any software package and that don’t require special plugins. Furthermore, I’m particularly enamored with vendors who listen to and take suggestions to heart from their customer base. No, this suggestion wasn’t mine, but the X Descendant Chart was implemented within a week of when it was suggested by a customer. Two weeks later, it was in production – and now all Charting Companion customers benefit. A big thank you to Pierre Clouthier at Progeny Genealogy. Recently, someone wrote to me and said that they thought the autosomal DNA matching between groups of family members was wonderful, but they have “just one first cousin” and feel left out. So, I decided to see what could be done with just two cousins. In this case, the two cousins are full siblings and both first cousins to my mother, Barbara. This would be the same process whether there was one or two cousins, since the two are siblings. Utilizing two cousins who are siblings just gives me the advantage of additional matching and triangulation capabilities. This does presume that both people involved are willing to share and do a bit of comparison work on their various DNA accounts. In other words, you can’t do this by yourself without cooperation from your cousin. Here’s the common ancestor of our testers. Barbara, Cheryl and Don took a Family Finder autosomal DNA test at Family Tree DNA. The DNA shared by Barbara, Cheryl and Don is from their common ancestral couple, Hiram B. Ferverda and Evaline Louise Miller. Some of that shared DNA will be Hiram’s Ferverda DNA and some will be Evaline’s Miller DNA. The only way to differentiate between the Ferverda and Miller DNA is to test people who are only Ferverda or only Miller, descendants of people upstream of Hiram and Evaline, and if there are any common segments between the testers and those Ferverda or Miller individuals, you can then assign that DNA segment to that side of the family – Miller or Ferverda. I’m using Barbara’s chromosome as the “match to” background, below. Cheryl, in orange, and Don, in blue, are shown as matches to Barbara. You can see that these three people share a lot of their grandparents DNA. You can also see where Don and Cheryl didn’t inherit the same DNA from their father, in some instances, like on chromosome 1 below, where Cheryl (orange) matches Barbara on a much larger part of the chromosome than Don does (blue.) But then look at chromosome 13 where Barbara and Don match on a huge segment and Cheryl, just a small portion. Don and Cheryl inherited different DNA from their parents at these locations. The three testers’ common DNA segments on chromosome 1 are shown in the table below. I’ve colored Cheryl’s pink and her brother, Don’s, blue. You can see that Barbara matches some segments with Don that Cheryl didn’t inherit from her parents. All of the DNA Barbara matches with Cheryl on this chromosome is also matched, at least in part, in that location, with Don. The chart below, matches the graphic above, for chromosome 1 and is the “view data in a table” option on the chromosome browser as well as the leftmost “download to excel” option. The download to excel option at right downloads all of the matches for the individual, not just the ones currently showing in the chromosome browser. When at least two known relatives have tested, we have something to compare against. In this case, we have a total of 3 people, 2 siblings and a first cousin, before we start matching outside known family. We don’t know which of their shared DNA comes from which ancestor, but we can now look for people who match Barbara and at least Cheryl OR Don which proves a common ancestor between the three individuals. Matching Barbara, Cheryl AND Don would be even better. The gold standard for DNA matching, called triangulation, that proves a particular segment to a specific ancestor is as follows. All (at least 2) people match you on the same segment. Those people also match each other on the same segment. Meaning, at least three people with a known common ancestral line must match on the same segment. The key word here is “on the same segment”. The next thing to do is to find out which of Barbara’s, Cheryl’s and Don’s matches are “in common with” each other. This means Barbara, Cheryl and Don all share a matching segment with these other people, but without additional analysis, we can’t determine whether they share a match on the same segment or not. I ran Barbara “in common with” Cheryl and you can see that the first two people returned on that match list were me and Don because matches are listed in the order of the largest cM of shared data first. The “in common with” tool is the blue crossed arrows, below. Next I ran Barbara in common with Don. There were a total of 43 people in common with Cheryl and 49 with Don. I downloaded the matching individuals (download link at the bottom right of the match page) and sorted them in a spreadsheet to see who matches whom. 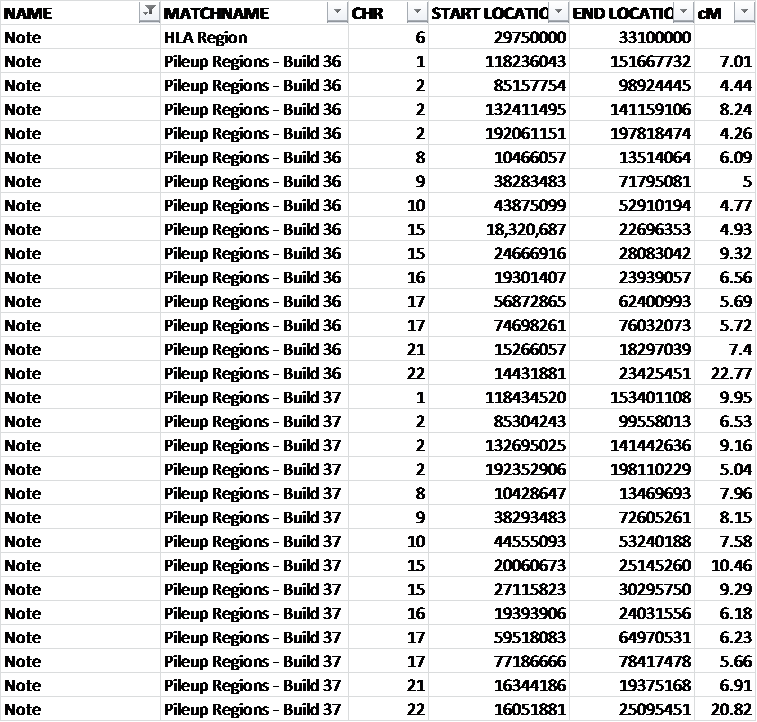 Here’s what the first part of my spreadsheet looks like (sorted in chromosome and segment order.) I colorized the rows by cousin for easier visualization. We have 92 total matching individuals in common with Barbara and Cheryl and then Barbara and Don. A total of 19 people are listed as matching BOTH Cheryl and Don (for a total of 38 rows in the spreadsheet), so that means that there are 54 people who are in common with either Barbara and Cheryl or Barbara and Don, but not in common with all 3, Barbara AND Cheryl AND Don. This illustrates how differently siblings inherit DNA from their parents and how it affects matches another generation later. Clearly, the people who match all three individuals, Barbara, Cheryl and Don are likely the closest relatives. So let’s focus on those closest matching people. If you were utilizing only one cousin here, you would simply utilize every “in common with” match between two individuals and move forward. Because I have siblings here, and because I don’t want to deal with 72 different people, I’m using the fact that they are siblings to focus my efforts on the most closely related matches – people who match Barbara AND both siblings. You could also limit your focus by something like a common ancestral surname between all match members. The next step is for each tester, meaning Barbara, Cheryl and Don, to compare each individual on the common match list to their DNA. This means that Barbara, Cheryl and Don all three will compare to all 18 individuals. We now have only 18 matching people, instead of 19, because I removed my own matches, since mine are a subset of Barbara’s. Checking to see how each of our testers matches each common matching person is the only way to determine that there is a three (or 4) way triangulation that will confirm a common ancestor. There are two ways to do this at Family Tree DNA. 1. You can, 5 matches at a time, compare in the chromosome browser, then download only the matching segments to a spreadsheet for those 5 individuals. This means 4 sets of matches for each of three people. 2. You can download Barbara, Cheryl and Don’s entire segment match list and then eliminate the matches that aren’t relevant to the discussion – meaning everyone except the 18 common matches between the three people. The download option for the entire segment match list for the person whose kit you are looking at is shown at the top of the chromosome browser, to the right. Downloading the currently showing individuals matching segments is shown at the top of the chromosome browser, to the left. Because we can only push 5 people at a time to the chromosome browser, in this case, it will be easier to simply download all of the matches for each of the three individuals and then put them into a common spreadsheet and sort by the names we determined match in common between all three cousins. I downloaded all of the matches for Barbara, Cheryl and Don, colorized them and then sorted them in the spreadsheet by the name of who they matched. I then searched for the names of the 18 individuals who matched Barbara, Cheryl and Don, and copy/pasted them into a separate spreadsheet. I could then sort the 18 matching individuals results by chromosome and start and end location. Barbara’s DNA matches are white rows, Cheryl’s are pink and Don’s are blue. The segments where Barbara, Don and Cheryl all match more than one other person on an overlapping area of their DNA segments are colorized green. This means that 4 or more people match on that same identical segment, the three known cousins and at least one other person. The segments where at least Barbara and either Don or Cheryl (but not both) match at least one other person are colorized yellow. This means that least three people match on that same segment. Since the gold standard of triangulation is 3 individuals matching on the same segment, both the yellow and green segments contain matches that fall into this category and are triangulated. All of those segments match at least two of the cousins, who match each other, plus in some cases, additional people too. Let’s walk through one triangulation sequence. In the green cluster, above, you can see that Barbara, Cheryl and Don all match Arthur on overlapping portions of the same segment. The overlapping portion between all 3 individuals and Arthur runs from 49,854,186 to 53,551,492. In addition, both Don and Cheryl match Tiffany on part of that same segment and Barbara matches Dean on part as well. These segments aren’t exactly the same for any of the cousins, with different amounts of matching DNA as reflected in the different cM and SNP values. So, who is triangulated based on just this one green cluster? Barbara, Cheryl, Don and Arthur are triangulated to a common ancestor. We know that common ancestor is either the common ancestor of Cheryl, Don and Barbara – Hiram Ferverda and Evaline Miller – or upstream of that couple. Tiffany is triangulated to both Cheryl and Don, but since Cheryl and Don are siblings, that’s irrelevant at this point – meaning we can’t tell if that match is IBS by chance or real because there is no additional match – at least not in this cluster. In other words, the DNA that came from Hiram Ferverda and Evaline Miller is present in these matching people as well. The million dollar question, is, of course, which upstream ancestor did it come from? We genealogists are never satisfied, are we? Every answer just leads to more questions. Before we begin looking at the DNA results and discussing what they mean, I want to share with you the family tree of Hiram Ferverda and Evaline Miller, because the DNA of the people who match Don, Cheryl and Barbara had to come from these people as well. This chart shows 7 generations back from Barbara, Cheryl and Don. The common ancestors of the people with whom they triangulate are likely to be within this timeframe. The colorized ancestors above are the ancestors who contributed the X chromosome to both John Ferverda, Barbara’s father and Roscoe Ferverda, Cheryl and Don’s father. In my working example, below, I’m utilizing the matches on chromosome 14 because chromosome 14 includes examples of a couple of interesting features. Let’s look at the first green grouping. All three cousins match to SB and then Barbara matches also to Constance and William, our Lentz cousin on part of that overlapping segment as well. This suggests that this grouping might come from the Lentz side of the Miller tree, although we’ll see something else in a minute that might give us pause to reflect. So just hold that thought. Regardless, it does tell us that these individuals do share a common ancestor and it’s on the Miller side, not the Ferverda side. The second green grouping is larger and includes larger segments as well, which are more reliably used, although the smaller green cluster clearly meets and exceeds the triangulation requirement of 3 matching individuals on the same segment. This larger green cluster is actually quite interesting, because there are a total of 4 individuals, Ellen, Arthur, Eric and Tiffany who are all triangulated on this same segment with Don, Cheryl and Barbara. So, not only are they triangulated to Don, Cheryl and Barbara, but also to each other. These 7 people all share a common ancestor. The yellow grouping shows an area where Eric matches Barbara and Don plus Arthur as well, but not Cheryl. We don’t know anything about Arthur or Eric’s genealogy, so we don’t know if this is Miller or Ferverda DNA, at least not yet. We’ll learn more about Arthur and Eric in a minute, even without their genealogy! There are a couple of other areas on other chromosomes that are of interest too. On this cluster on chromosome 12, we find a known Miller cousin, Rex, 2nd cousin to Barbara, Cheryl and Don. Because Rex also descends from the parents of Evaline Miller, we know that this segment shared with Rex has to be Miller DNA, not Ferverda DNA. On this segment of chromosome 3, below, we see that Barbara, Cheryl and Don match Herbert, another known Miller cousin, plus Dee and Constance in much smaller amounts on the same segment. This tells us that this segment is descended from our common ancestor with Herbert. Barbara, Don and Cheryl’s common ancestor with Herbert is Daniel Miller and Elizabeth Ulrich (Ullery), which makes them third cousins once removed – except – Herbert got a second dose of Miller DNA because Daniel Miller’s son, Isaac, married his first cousin who was also a Miller and shared grandparents with him. So Herbert, genetically, is closer than he would appear since he received the double dose of Miller DNA three generations upstream. Gotta love these close knit families. The Millers were Brethren. These double doses of family DNA often carry forward by matching downstream when they might otherwise not be expected do so. That’s the upside of these endogamous groups. Now, here’s the downside. This is a very common situation in endogamous communities. To make matters worse, we are dealing with very small segments here, where we often see confusion. However, let’s look at the possibilities. We do have triangulation, so one of three things has happened here. First, the Brethren are an endogamous population that intermarried nearly exclusively within their faith. The Lentz and Miller families were both Brethren. Our Lentz cousin has some Miller in one of his lines. This is entirely possible since he has a “short” pedigree chart and his families are living in the same Brethren communities as the other Lentz and Miller families. Our Miller cousin has some Lentz in one of his lines. That is less likely, because his genealogy is pretty well fleshed out, although certainly possible because, once again, the families were living within close proximity and attending the same churches, etc. This segment is truly a population based segment and will be found in people descending from that same base population. If this is the case, we still received it from one of our ancestors who came from that population, but since the Lentz and Miller lines may have both carried this same segment, we can’t tell who it came from. In other words, their common ancestor is further back in time than the Lentz and Miller families found in the US. This segment cannot be IBS by chance because it does triangulate with the three cousins, Barbara, Don and Cheryl. The definition of IBS by chance shows us that chance segments would not phase (or match with) with a parent. If Don, Cheryl and Barbara all three carry this matching segment, it’s because their fathers both received it from their grandparents who were the common ancestor of Don, Cheryl and Barbara. Neither Cheryl, Don nor Barbara can phase directly to their parents, who are deceased, so in this case, matching against first cousins is the best substitute we have. We know that common DNA between the first cousins had to come from their father’s, who were brothers. This in essence virtually phases Barbara, Don and Cheryl to their father’s on these matching segments. Not ideal, by any means, but even partial parental phasing is better than no phasing at all. A third match, Dean, shows Miller in his family tree, but I could not connect his Miller line to the Johann Michael Miller ancestral line, from which our Miller line descends – so Dean is not a known cousin. Sometimes a common surname, even if found in the same geographic location, is not proof that the DNA connection is through that line. It’s easy to make that assumption, but it’s an assumption that is just waiting to bite you. Don’t do it! Because of our known, proven DNA and genealogy matches to Herbert, we can attribute all of the segments where Herbert triangulates with either Barbara and Cheryl or Barbara and Don as Miller for all people involved. This means that this common DNA descends either from Daniel Miller and Elizabeth Ulrich or Daniel’s father Philip Jacob Miller and Magdalene, surname unknown. Why have I listed two couples? Because, remember, Herbert has a double dose of Miller DNA from cousins and we don’t know which segment Barbara inherited, one from Daniel/Elizabeth or one from Philip Jacob/Magdalene (or some of each.) If the segment is from Daniel/Elizabeth, it could have come from either the Ulrich or Miller side. If it came from Daniel, then it also came from his father and mother, Philip Jacob/Magdalena and could either be Miller or Magdalena’s unknown line. Because of our known, proven DNA and genealogy matches to Rex, we can attribute all of the segments where Rex triangulates with either Barbara and Cheryl or Barbara and Don as Miller for all people involved. Their common ancestor is John David Miller and Margaret Lentz, so their shared DNA could be either Lentz or Miller and is likely some of each. For segments where there is no triangulation, but Barbara matches either Herbert or Rex, I still note that segment as Miller on my spreadsheet, since they are proven cousins, but I just omit the triangulation note. For Barbara, that’s a total of 51 segments of her DNA that we can now assign to a Miller ancestral couple. Furthermore, every segment that Barbara matches with either Cheryl or Don is now confirmed to be from her father’s side of the family, not her mother’s. While we don’t have Barbara’s parents available for testing, this is a pseudo way to phase your results to determine matches from one parents’ side of the family. For Barbara, that’s a total of 91 segments, some of them quite large. For example, roughly half of chromosome 13 matched with Don. Just as a matter of interest, within those 91 segments that Barbara matches with either Don or Cheryl, a total of only 7 segments matched exactly between all 3 individuals in terms of start and end location, cMs and SNPs. While you might expect a number of small segments to match exactly, these weren’t all small. In fact, most weren’t small and some were quite large. Exactly matching DNA segments between Barbara and Cheryl and Barbara and Don. This means that these segments were not divided at all in a total of 5 DNA transmission events. Additionally, I carry two of these exact segments as well, so those two segments survived 6 transmission events. Clearly these segments are what we would term “sticky” because they certainly are not following the statistical average of dividing the DNA in half (by 50%) in each transmission event. There is one more thing we can tell from matching. Both Barbara and Cheryl match with SB on the X chromosome on the same segments. This is particularly interesting because of the special inheritance path of the X chromosome. We know that SB must be related on Evaline Miller’s side of the family, because John and Roscoe Ferverda did not receive an X chromosome from their father. So Barbara, Cheryl and Don have to have received it from Evaline. Unfortunately, SB listed no genealogy on Family Tree DNA, but based on the X chromosome inheritance path, I can tell you that SB is either descended from John David Miller and Margaret Lentz, or from the Schaeffer, Lentz or Moselman lines colored pink or blue, below. At this point, I made a chart of how the matches grouped with each other on each of the green clusters. I intended to create a nice chart in Excel or Word, but with all of the various colors of ink involved, I didn’t think I could find enough color differentiation so we’ll just have to suffer with my hand-made chart. There are subtle color differences here – a different color or marker type for each of the 19 green clusters. What I did was to look at each of the green DNA spreadsheet groupings and create a colorized chart, by group, for each grouping. So everyone in the first cluster had their X in the boxes of who they matches in the same color, say blue pen. The second group, orange marker, and so forth. That way I can see who was orange or yellow or blue and if those groups tend to cluster together. Remember Arthur and Eric from above, whose genealogy we knew nothing about. You can see, for example, that Arthur matches in various groups with lots of people, and most often, Tiffany. Arthur and Eric also match in multiple groups that include each other and Rex, a known Miller descendant, so we can attribute both Arthur and Eric’s DNA matches to the Miller side of the tree. Keep in mind, all of these people also match with Barbara, Cheryl and Don. Tiffany clusters with Arthur and Sarah and Eric in multiple groups and with Constance, David, Ellen, Leland and Rex in at least one other cluster. So another Miller side person. On chromosome 14, Eric, Ellen, Arthur and Tiffany were all triangulated on the same segment with Don, Cheryl and Barbara, so we know those 7 individuals unquestionably share a common ancestor. Let’s look at SB again, our X match. Since SB’s X connection can’t come from the Miller side, given the X inheritance path, and SB also matches with our Lentz cousin, it’s likely that SB is related through the Lentz lines. Normally, when doing this matching relationship chart, you tend to see two distinct groupings, a mother’s side and a father’s side. In other words, there will be some groups that absolutely don’t overlap with the others. That’s not the case here. So, by now you might be wondering what happened to the Ferverda side of the family? I was secretly hoping to find a closet Ferverda relative in this exercise, and I thought we might have, actually. Notice that Harold has no clustering at all, but he clearly matches Barbara, Cheryl and Don – but doesn’t cluster with any other Miller or Lentz cousins. Therefore, he could be from the Ferverda side of the family, but since he provided no genealogy information or surnames at Family Tree DNA, I can’t easily tell. However, I am not entirely without recourse. I checked Harold “in common with” Barbara and discovered that he matches both Rex, our Miller cousin and William, our Lentz cousin, so even though Harold did not triangulate with William and/or Rex on any segments with both Barbara and/or Cheryl/Don, those Miller/Lentz matches certainly suggest descent from this line. I’ll be sending him an e-mail! So, there are no Ferverda cousins represented in these matches. I decided to check one more thing, now that I know that all of these matches are on the Miller side and that we have 3 known, proven genealogical cousins, Rex, Herbert and William. I wanted to see how many of our individuals who match Barbara, Cheryl and Don also match one of the known cousins. I selected Barbara as the base match kit to use, since we know they all matched Barbara, Cheryl and Don, and then I ran “in common with” for each one of them with Barbara, with the following results. A few did match one of the Miller or Lentz cousins, but fewer than I expected. *However, we had a surprise. Dean matched another Miller male individual whose line is proven to descend through two children of Philip Jacob Miller and Magdalena, surname unknown. Another first cousin marriage. Another cousin discovered! Furthermore, I noticed yet another individual, Doug, in Barbara’s match list and in common with 6 of the matches as well. Looking at Doug’s pedigree chart, not only is he a Miller descendant, he also descends from two of the Miller wives lines too. Another cousin confirmed! But why no Ferverda matches? The Ferverda side of the family immediately jumps the pond to Holland, with Hiram himself being an immigrant as a young teen in the 1860s. There are few Ferverda (Fervida, Ferwerda) descendants here in the US to test, and many are Brethren or Mennonite. Few people in the Netherlands have participated in DNA testing. The converse of that, Evaline Miller’s lines have all been in the US since the early/mid-1700s, so there are lots of descendants. Oh, the difference about a hundred years and 5 or 6 generations makes in the number of descendants who might be available to test. This situation, unfortunately, created a very lopsided chart without the division I’m used to seeing. On the other hand, thank goodness Evaline’s line and Hiram’s line are very distinct! At this point, if you’re doing this “one cousin” exercise, you’ll need to do a few things. 1. Check each of the matching individuals to see if they have uploaded or created a pedigree chart at Family Tree DNA. If they do, their pedigree icon will be green, shown below. If so, click on the icon and search for every surname (and variant) associated with your known common lines with your cousin. 2. Check to see if these people entered a list of surnames, even if they don’t have a pedigree chart. The surnames are listed in the furthest right column. If you have entered your surnames, any that match yours will be bolded. Beware of variant spellings. You can see above that I am the only one of the matches shown with a pedigree chart icon, shown in green, and the common surnames are bolded at right. 3. If your matches don’t have a pedigree chart, write to them and tell them you have a common ancestor and give them a list of your ancestors in your direct line. Please, PLEASE include the name on the kit that you match. Many people manage multiple kits and will ignore requests with only partial information. 4. If you have additional cousins to test, do so. I’m sure you can see how valuable additional cousins DNA would be. 5. Be sure to check your matches by “ancestral surname” to be sure that you haven’t missed any cousins who have already tested. The ancestral surname search box can be seen above the “known relationship” heading in the graphic above. 6. If you haven’t done so, enter your surnames under the “Manage Personal Information” tab under “My Account” at Family Tree DNA. Then click on the genealogy tab, then Surnames. 8. Run “in common with” for each of the common matches of your two cousins and look for common matching names between them. Those matching “in common with” names serve as a hint as to shared ancestry. Your answer may be hiding in your cousins’ trees! Utilize all of these tools to help your search. Not bad for thinking we couldn’t do anything with our DNA matches because we had “just one cousin” to work with, even though I cheated and used siblings. What, exactly, did we manage to do? I attributed 91 segments of Barbara’s DNA to her father’s side of the tree. I filled in 51 segments of Barbara’s DNA to ancestral couples. I found 5 confirmed genealogy/DNA cousins. I found 16 people whose genealogy is unknown, but who triangulate with Barbara, Cheryl and Don. We know for sure which side of the tree these people match on – all Millers. I can tell the X match which lines they descend from, even if they don’t know. I can do one more very cool thing. Utilizing the Lazarus utility at GedMatch, I can now recreate at least a partial autosomal DNA file for both John and Roscoe Ferverda, the fathers of our testers. Join me in a couple days and we’ll see how that works! This same process works between any two people who know how they are related and their common ancestor. It’s a great way to find cousins you didn’t know you had, or you didn’t know have DNA tested, and how they are related to you and each other. Some people get very discouraged when even thinking about working with endogamous populations, or cousin marriages. One of the reasons I used this particular example is that I wanted to illustrate that while these situations are challenging from time to time, they are far from hopeless – so don’t let that deter you. In fact, of the 5 confirmed cousins discovered during this process, some in unexpected ways, at least 3 and possibly 4 are through multiple lines. Some of these matches are probably thanks to endogamy. A few days ago, I received a note from someone who descends from my Miller line. Specifically, from our common ancestor, Philip Jacob Miller (1726-1799) and his wife, Magdalena (1727-1808). Many records give Magdalena’s surname as Rochette, but I have found not one shred of evidence as to that or any other surname, nor can I find where the information about the Rochette surname originated. So call me stubborn, but until there is some sort of proof, I’m not using it. I will say one thing though. Philip Jacob Miller was Brethren, as were his parents, and it’s very likely that his wife was also from the Brethren community – and there was no Rochette in the Brethren community or even in the same county. And yes, I’ve personally checked the records. Philip Jacob Miller and wife Magdalena had two sons, David, who my newly found cousin descends from, born in 1757, and Daniel, who I descend from, born in 1755. My cousin and I had “met” on 23and Me a year or so ago, but since she was not at Family Tree DNA, she could not join the Miller-Brethren surname project and I couldn’t compare her results to those of other known Miller descendants. The Miller-Brethren DNA project focuses on the Miller families who were members of the Brethren (or similar) religions – and yes – there was more than one genetic Miller family – even in the same county and congregation. They even moved cross-country together, yet they were not all from the same Miller ancestral line. Y DNA busted that assumption years ago, but it was not at all what we expected to find! When I received a note from my cousin that she had taken advantage of Family Tree DNA’s (almost) free transfer opportunity, I was thrilled, because we could then compare her to the rest of the clan. In the Miller-Brethren project, we have three other cousins, all of whom descend from Daniel Miller in one way or another, that my cousin matches. Her best match is to my mother with 82 shared centimorgans and next, with me at 64. You can see the comparison on the chromosome browser, below, at the default thresholds. Green is my mother, orange is me and blue is cousin Herbie who descends from another son of Daniel Miller. You can see that there is a very large chunk of DNA on chromosome 14 where we all match. A fourth cousin, shown in pink, also descended from Daniel, does not carry this segment of DNA on chromosome 14. Dropping the threshold to 1cM produced more matching segments, but still no pink on chromosome 14, so clearly our pink cousin did not receive any Miller DNA on chromosome 14. However, we can attribute a huge chunk of chromosome 14 to Philip Jacob Miller and wife, Magdalena. This segment is quite large, a total of 48cM and 12,894 SNPs. A second very interesting match is on the X chromosome. It’s fairly large too, a total of 11.84cM broken into three segments. You can see that both mother and I match my cousin on the same X segments – obviously from Philip Jacob Miller and Magdalena. Right? Wrong. Wrong. Very wrong. Do you ever just get a sense that something isn’t right? A second sense that you need to check again? Well, in genetic genealogy, never assume. After I thought for just a second, I decided to grab my X chromosome map, because something just didn’t seem right. So glad I did, because Philip Jacob Miller and Magdalena are NOT on the X inheritance path of my mother (and therefore not me either) so the X match CANNOT come from them. Using Charting Companion software, I can easily see, in pink and blue, who my mother’s X chromosome comes from in her lineage. You can also see that Philip Jacob Miller isn’t on the X path, and neither are his descendants for two downstream generations – not until David Miller’s wife, Catharine Schaeffer, brings her X to the game. So, the X match cannot be through this Miller line. In addition to this chart, I also sent an X chromosome pedigree chart to my cousin. She looked it over, and made a discovery. Moving to my grandmother’s X chart, because the print is too small to read if I add another generation on my mother’s chart, you can now see Maria Magdalena Weber. Maria Magdalena Weber was born in 1724 in Mutterstadt, Germany to Johann Martin Weber and Maria Magdalena Schunck. As it turns out, my cousin has another ancestor Eva Maria Weber, born in 1709, someplace in the Phalz portion of Germany, first found in Oley, PA. Now, it turns out, that Oley, PA is also where some of my other ancestors lived. The DeTurks, Hochs and Deharcourts married into the Schaeffer family who migrated to Montgomery County, Ohio and married into the Miller family. And yes, for those who are wondering, the Schaeffer line IS in my X path and yes, there are brick walls there that need to fall. Looking back at the first fan chart, Catharina Schaeffer is the wife of David Miller, son of Daniel Miller, son of Philip Jacob Miller and Magdalena. Yep, it’s a small world. And truth is stranger, sometimes, than fiction. So, is our common ancestor a Weber? And if it is a Weber, is it from the Mutterstadt Weber line, or is it a mystery person from Oley, PA – a brick wall that hasn’t fallen yet? Now all I need is a tool to find every other person who matches me and my cousin on that same X segment and see who their ancestors are. Webers or Oley, PA people, or both???? possible that I descend through that line twice???? The genealogy Gods certainly have a perverse and twisted sense of humor. The lesson here is never assume. Just because you have positively identified your common ancestor with a match, and proven it with triangulation, doesn’t necessarily mean that is your ONLY ancestor that you share with that match. You know what assume does. Among other things, it gives you a headache.